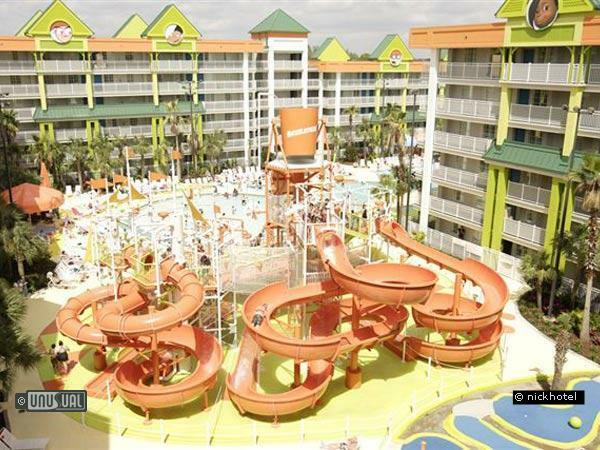 Family themed hotel with integral water park for children and Nickelodeon characters throughout. Have the SLIME of your life at the first-ever Nickelodeon Family Suites by Holiday Inn in Orlando, Florida! Sleep in 2-Bedroom Kidsuites themed around some of the most popular Nickelodeon Characters such as SpongeBob SquarePants, Dora the Explorer and Cosmo and Wanda from The Fairly OddParents over breakfast. This hotel is a destination and a vacation unto itself. Sleeping in a Nicktoon-themed bedroom, having breakfast with some of your favorite Nickelodeon characters, sailing down waterslides and flumes and watching your parents get pied and your sister get slimed, all in a brightly colored, highly energetic 24-acre, have contributed to labeling this as an “attraction with a sleepover.” From sunrise to sunset, the Orlando resort immerses families in a Nickelodeon-themed attraction complete with the energy and excitement you would expect from 777 suites full of thrilled kids taking in the orange and slime green atmosphere from their favorite kids network, Nickelodeon. When the day is done, Holiday Inn hospitality ensures a great night’s sleep. There’s always slime at one of the two interactive water park areas during the live Nickelodeon shows that encourage eager volunteers to scream with delight when the show host shouts, “Who wants to play?” These pool areas each contain a gigantic pool with waterslides, flumes, and multi-story waterplay features. And to top that, the resort features a court with multi-height basketball hoops and a mini-golf course. The Mall houses The Arcade, a 3,000-square-foot game room … with prizes, of course … a rental facility for in-suite game systems, and the Kid’s Spa, designed to pamper kids with hair braiding, hair wraps, temporary tattoos, manicures and pedicures. 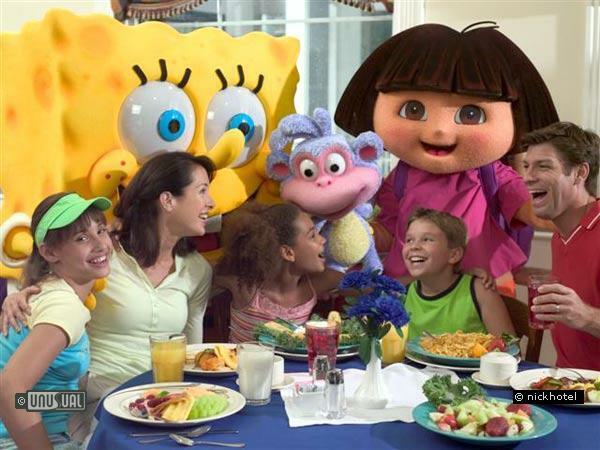 The Mall also features a food court with nationally branded eateries, the Buffet which serves a hot, American breakfast buffet every morning and the Nicktoons Café, the home of the Character Breakfast where families can interact with some of the most popular Nickelodeon characters like SpongeBob SquarePants, Dora the Explorer and Cosmo and Wanda from The Fairly OddParents. The Kids Eat Free program is available to children age 12 and under at select venues. Families are invited to visit Studio Nick, a million-dollar state-of-the-art theater that offers nightly interactive Nickelodeon entertainment that gets the whole family involved in the action. If parents are looking to escape, the Nick @ Nite Lounge provides a comfortable, welcoming atmosphere to relax and enjoy a cocktail, frozen drink, or after-dinner coffee in a full-service bar while taking in sporting events or Nick @ Nite shows. Or parents may want to look into the Nick After Dark program where “the kids will play while the parents are away.” This evening program offers activities to kids ages 5-12 while allowing free time for adults. Just because it’s time for bed does not mean the fun has to end. The hotel features 2- and 3-Bedroom Nick-themed KidSuites® rooms providing separate spaces for kids and parents. Each suite contains a separate parlor area with a 25” TV, pull-out sofa, and game table; an adult bedroom with a king- or queen-size bed, a 20” TV, and more; and a Nick-themed kid’s bedroom with two twin beds or bunk beds, 20” TV and more. Complimentary scheduled transportation to all four Walt Disney World theme parks, Universal Orlando, SeaWorld and Wet ‘n Wild is available daily. However, at the hotel, there’s so much to see, such as playing on the giant water playgrounds and interacting with the Nicktoon characters that families have grown to love, that kids could play all day and the hotel is finding that kids don’t want to leave. Thinking of a warm weather holiday for next year? What about Cryatal River and Citrus County - about 80 miles West of Orlando - and about 2/3 of the price. While there are activities all year-round, between June and September, the Gulf of Mexico offers up an exciting adventure – scalloping season. Once considered the origin of stories about mermaids, manatees are descended from elephants, sharing the same intelligence and memory of their land based ancestors. Like humans, they’re mammals and have a number of close relatives including the Australian dugong and the North Pacific sea cow, which was sadly hunted to extinction in 1768. This place was okay, I'd rather stay at a Disney Resort than here. This resort is focused too much around kids ages 5-11. I went there when I was 10, now I'm 15, my sisters would like to go again and they are now 12, expecting them to have a sense of quality, looks like they don't. The only two things that they had for adults were a bar in the commons area and a fitness center that was in a suite, but embarrassingly, part of the fitness center was in the kid's "room," but all it had was a curtain for a door. The resort did have a good assortment of foods on the buffets, but the chow mien tasted TERRIBLE, tasted like something you would get at a county/state fair. The suites were, indeed, very small. The resort is as poor as the cartoons they have now. This place is great for kids and VERY young-at-heart parents, but not much for everyone else. Honestly, for my resort, I can do MUCH better than this, yet focusing around families with ALL age groups. Not worth the money. Very. I repeat very overpriced! There are so many nice places to stay nearby, don't waste your money here. Crowded. Dirty. Rude workers. Rooms are small with no privacy. Events got cancelled. Just yucky! Whoa this is not a budget hotel. Rates average more than $300 a night and there is an additional fee of $20 per person to use the waterpark. We loved Nickelodeon Family Suites. The theming is extensive and unique, the pools are outrageously awesome and amazing. This is a hotel for kids and the kids absolutely went nuts for it. Spongebob suites can NOT be beat! !